A couple of REALLY windy days the past two days. Looks like it is blowing in some cooler weather. Temperature this morning was in the low 70s. By the end of the week, the prediction is for low 50s during the day and low to mid 30s in the early morning. Increased chances for rain by the end of the week too. Generation schedule has been pretty much 2-4 hours of low generation some time during the day. Yesterday it was supposed to have been in the morning and today it is supposed to be in the afternoon. As they didn’t run anything until noon yesterday, we’ll wait and see what the actual it for today. Tomorrow’s projection is generation from 6:00 to 10:00 in the morning and again around 5:00 p.m.
Dana out last Saturday (yes, I’m behind again) with Mike and his son Ian from Kansas. Not a great day, but not a bad day on the tan b-bug, and the P&P midge. Bruce and Ron from Oklahoma attended our two-day school Monday and Tuesday. Since Tuesday was going to be such as bad day, we took to the water Monday afternoon for casting, rigging and fishing work. Back to the books Tuesday morning then a little more streamside work that afternoon. Wednesday, Chuck spent a half day with Stan. Best pattern that day was the copperhead black zebra midge. they had a pretty good day…considering. Bob had been out last week with Stan and decided he needed another fix on Friday…..so. 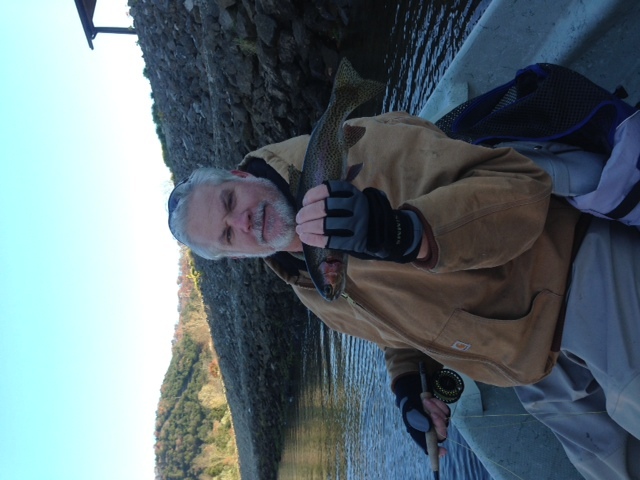 Good day for Bob on the ruby and copperhead black midges. Doug and Pam were on the water with Carolyn. We worked for our fish, but overall, it was a pretty good day. Caught fish stripping the holographic green crackleback and the CQ streamer. Best midges were the ruby and the copperhead black zebra. 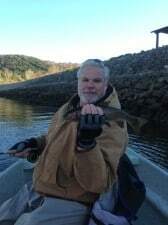 This entry was posted on Sunday, November 17th, 2013 at 12:37 pm	and is filed under Fishing Reports. You can follow any responses to this entry through the RSS 2.0 feed. You can leave a response, or trackback from your own site.